LOADS OF FUN FOR ALL AGES! After decades of concentrating on a single species during our fishing trips, Puffin Fishing Charters has decided to target various combinations of fish species depending on what is available at that particular time of our fishing season. 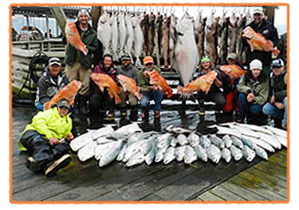 This multi-species fishing provides for a broader experience for our clients with the opportunity to bottom-fish with heavy rods and tackle seeking Halibut and other deep-sea dwellers, and to use lighter tackle to hook into some Rockfish or Salmon when those species are in the area. Combination trips also give you a “Captain’s Platter” of different fishing tastes to take home and enjoy! Halibut is on the menu throughout the fishing season, except during Wednesdays and possibly Tuesday, when halibut fishing is restricted in Southcentral Alaska by the International Pacific Halibut Commission. Different species of salmon are available at different times in the summer, with King (Chinook) Salmon typically present from May to early July; and with Silver (Coho) Salmon showing up from late June/early July through late August. Rockfish are typically present in rocky areas through the summer; and Lingcod can be retained beginning July 1. We design our multi-species trips depending on what species is available during the summer months with Halibut always being on the menu through the entire season. King Salmon/Halibut trips are available April 21st thru June for our King Salmon enthusiasts. 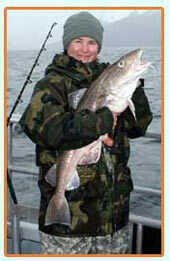 Rockfish (black rockfish)/Halibut trips are also available in May and June. By early- to mid-July through August, we target Silver (Coho) Salmon and Halibut with incidental catches of Lingcod and Rockfish. Our captains do their best to target as many species as possible during the trip, but due to time constraints, sea conditions, and the availability of certain species, most trips are dual-species. You do have the option of designing the fishing day by reserving the boat for yourself and your guests. You have the option of securing 10, 12, or 18 seats, depending on which of our vessels you select. With an exclusive trip, you can choose how you want to spend your fishing time, including what species you want to target and how much of your day you want to spend fishing for each, availability and weather permitting. Lingcod can be caught and retained after July 1. Unless you buy the entire boat for an exclusive trip, we will not be targeting Lingcod directly on our mixed charters (mixed groups of anglers not all together); however, if you hook a legal-sized Lingcod while targeting Halibut or Salmon or Rockfish, you are welcome to retain it. The Lingcod population has been in a decline in the last few years. We are working to do our part to help the resource recover by easing off the direct targeting of this species until we see tsheirpe numbers rebound. Current fishing rules allow charter anglers in Southcentral Alaska to retain two Halibut per day, one of which can be of any size and the other no greater than 28 inches in length. There is also an annual limit of four Halibut. There is no retention of Halibut on Tuesdays and Wednesdays in the 2018 fishing season. Once all anglers catch their Halibut, we switch to light tackle to try our luck at mooching (“jigging’) for Silver Salmon (Silvers start running about the first week of July through the end of August). If we are targeting King Salmon (May/June), we will be switching our gear over to start trolling. While we mooch for Silvers or troll for Kings, we often hook into various species of Rockfish. During the Captain’s Platter/Combination/Multi-species trips, we work to target Halibut, Lingcod, Rockfish, and Salmon, contingent upon the availability of each species. Sound good? 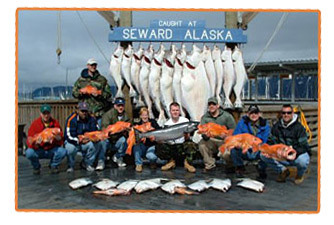 Reserve your Seward Alaska fishing charter now! For more information on catch limits click Catch Limits For 2018. 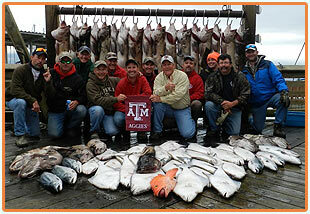 Long Range and Short Range fishing trips available.